Not just any insole. These are Performance Insoles! 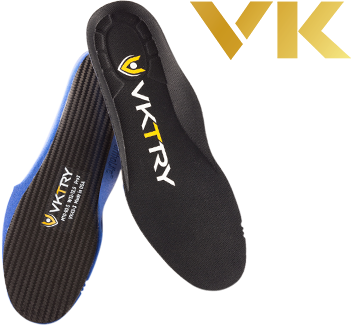 VKTRY Insoles are designed for athletes to optimize their performance during competitions and training. Their inception traces back to the US Olympic Bobsled Team to help them deliver speedy starts. Here’s how it works: a proprietary algorithm is used to determine the best flexibility level of the insole for you, based on your sport, weight, and foot size. These are not soft, cushy insoles. These insoles are made out of ultra-lightweight, aerospace-grade carbon fiber that absorbs the energy you exert as you step, stores this energy, and then releases it back to you resulting in a higher jump, a faster run, and improved performance all around. The rigidness of the insoles and the cushion top provide support, stability, and comfort. Harness your energy and take your sport to the next level with VKTRY!